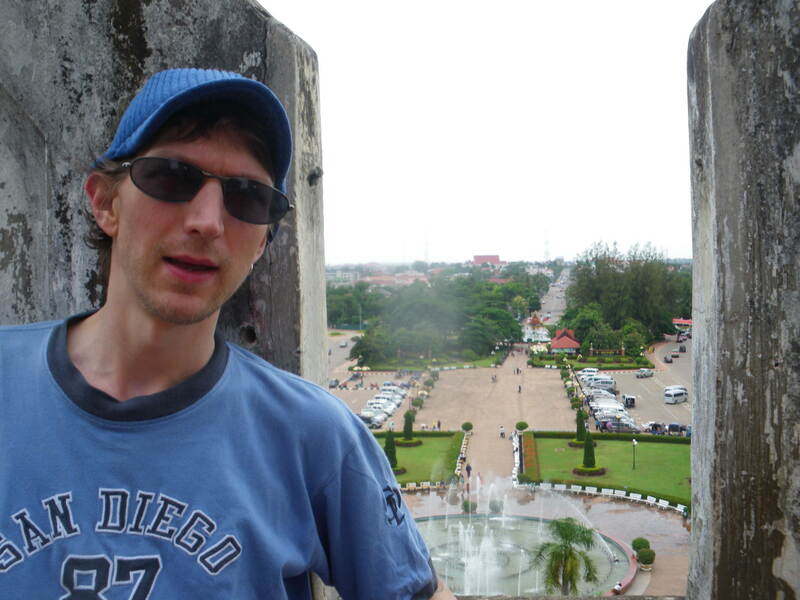 I loved the relaxed charm of Vientiane in Laos. It’s got to be one of the less well known capital cities in the world. 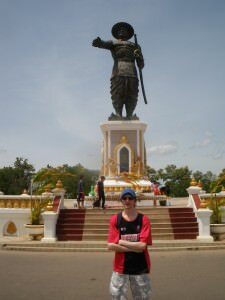 It was my first port of call when travelling in Laos (after arriving at the border point of Thanaleng) and I met up with a travel buddy there (Chaz – a fellow Ulsterman) and set about doing a more relaxed bit of sightseeing for a change. Nothing full on, and we didn’t do all the sights, but I’ve made this list of things to see and do in Vientiane as a rough guide. I ended up spending over 3 days in Vientiane in total, which is probably too much, but I had things to sort out and it was a place to relax. Rather than bore you with everything I did, here’s a short and simple top 5 things to do. 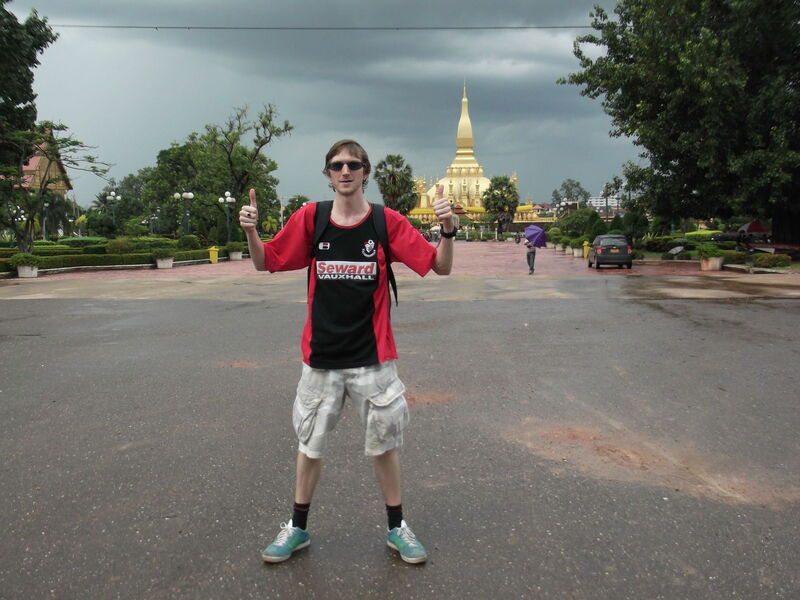 And yes, I loved Vientiane. Downtown Vientiane – almost all the streets look like this. Charmful and nothing fancy. 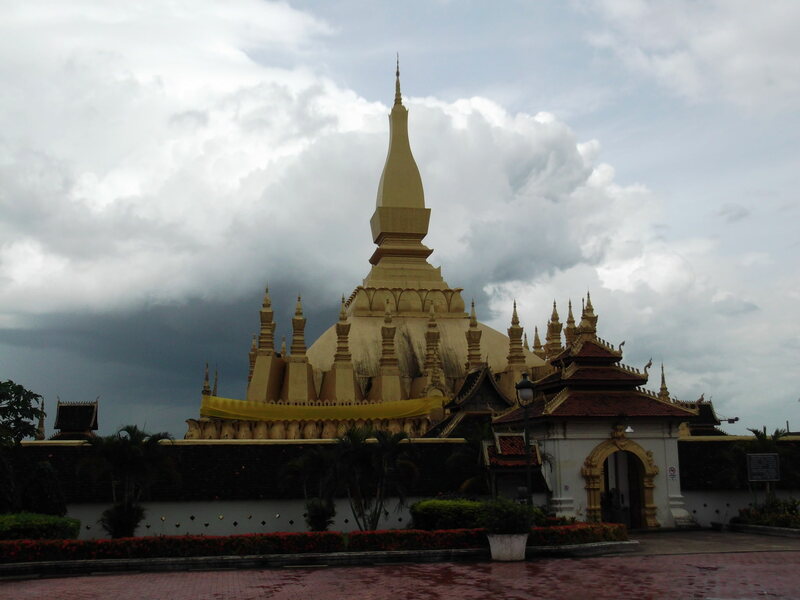 This national monument is on the edge of town and is Laos’s most famous symbol of sovereignity. Although it’s realistically walkable as it’s only 4kilometres outside the city, for the sake of a few thousand Kipp, just get a tuk tuk out there. Once a year this golden Buddhist Shrine plays host to thousands of Buddhists, this occurs in November. I visited in July. Pha That Luang is golden and is a work of art. It was something to admire for me, rather than get immersed into the religion side of things. An entrance ticket is cheap as, at 2000 Laos Kipp (around 25-30 cents US). Worth seeing. Patuxai (or Victory Gate) is also known as Vientiane’s “Arc de Triomphe” and it totally resembles the French one (which I visited back in 2007). However I’m not a big fan of Paris any more, so the Patuxai in Vientiane wins hands down with me. It has views of the city and just looks old and worn. You need to pay 3,000 Kipp to go to the top but you might as well in a city so relaxed, even this is a top sight! Although not everyone’s major sight to see, I liked the sentiment of there being a world peace gong in Vientiane. The only thing that annoyed me was they represented every country in the world on it (even Wales, Scotland, Gibraltar and Guernsey) yet they didn’t have a Northern Ireland flag, so to even things up I turned up with mine! 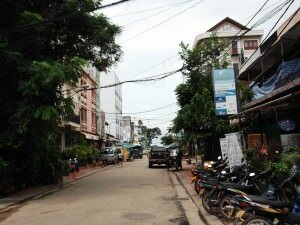 This is on the edge of Patuxai – about a five minute walk north along the path and across a roundabout. I know this is probably not high on your list of things to see and do in Vientiane but I liked it. 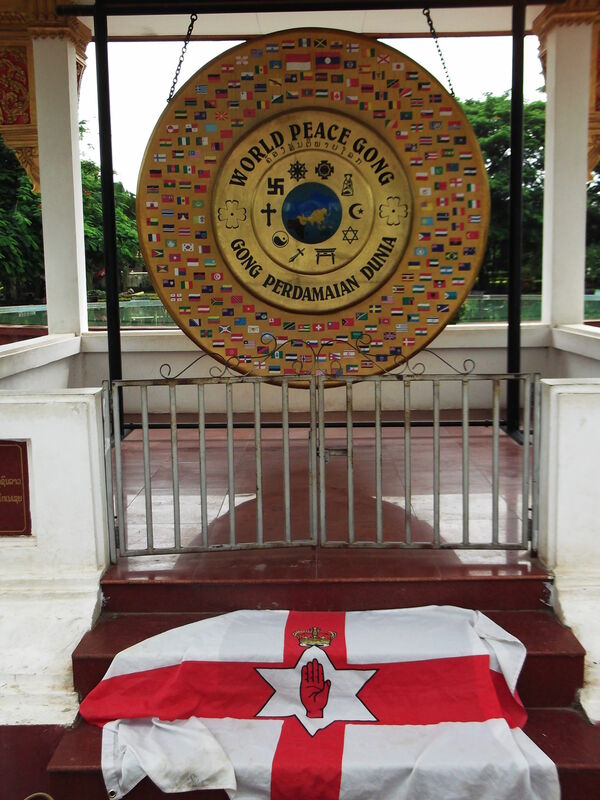 The World Peace Gong in Vientiane – nice but they neglected Northern Ireland so I brought my flag with me! 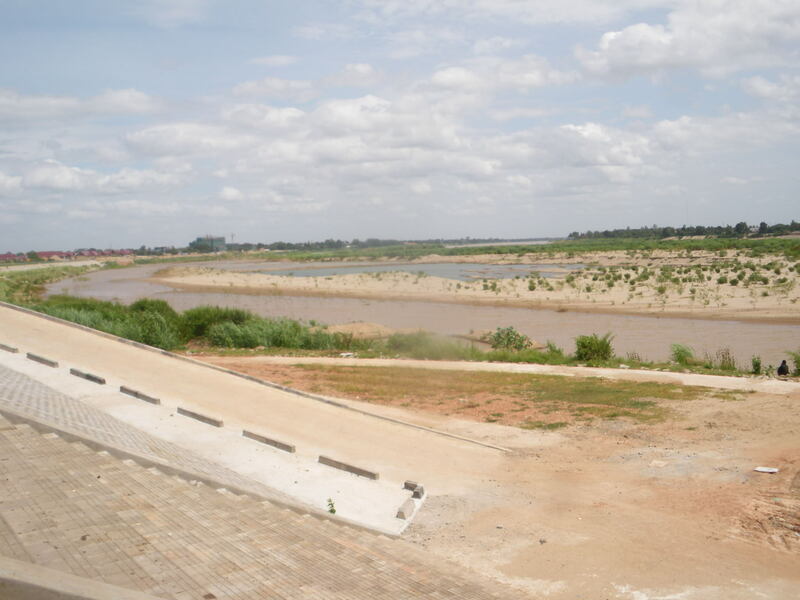 No visit to Vientiane is complete without heading to the riverside and waterfront where Vientiane overlooks the Mekong River and across the way is Thailand. I arrived into Laos by crossing Freedom Bridge from Nong Khai in Thailand on a train. 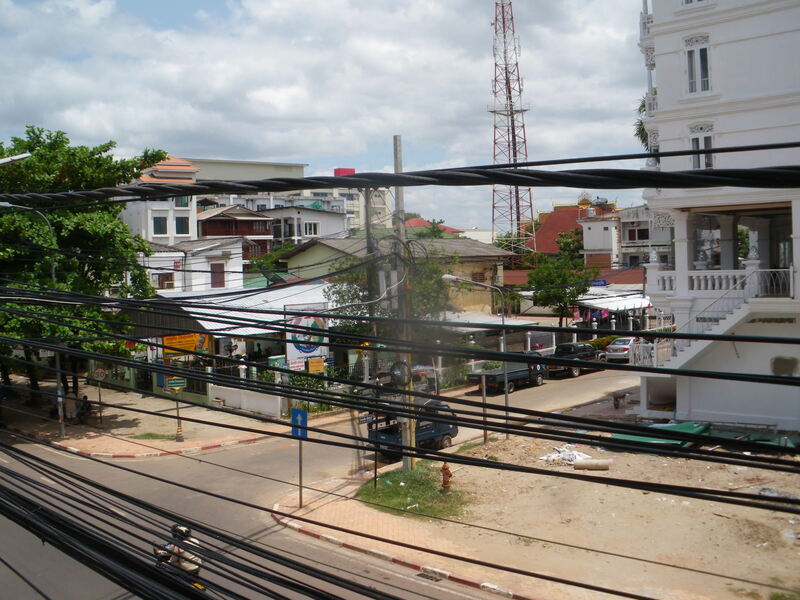 Once you are settled into your hostel in Vientiane, make the short walk to the seafront. 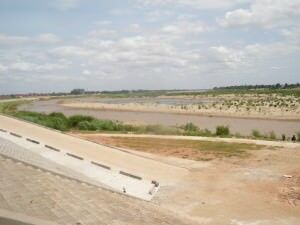 Two countries in one photo – across the Mekong is Thailand. 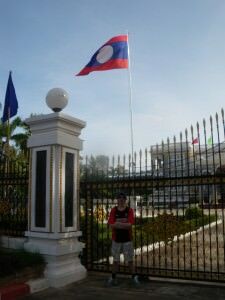 I took the photo in Vientiane, LAOS. The best things to see here are the King Anouvong Statue, which is a marvellous centre piece and arches tall over the gorgeous river and the seafront promenade. At sunset, have a beer and watch the hot ball sink. At night there is a huge market which is worth visiting for souvenirs. Yes, that’s right – here in the quiet relaxed charm of a capital city even less prominent than Paraguay’s Asuncion you should seriously chill out and check out the awesome bars. Don’t forget Beerlao is one of the finest beers in Asia. Vientiane is great for a pub crawl – there are loads of uncommercial, off the beaten track pubs here! Chaz and I love a beer and we worked our way through about 10 bars in the city! Our local was the Samlo Pub (they have a pool table) but we also loved the restaurants by the river for their cheap Beerlao and local food. 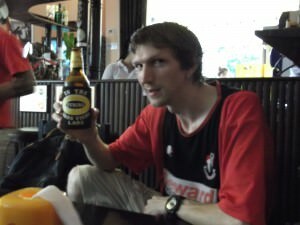 In Vientiane we also drank in the Belgian Beer Bar, @Home Club, Galaxy Bar and The Drop Zone. Although that is my personal top 5 of things to see and do in Vientiane, I neglected to mention the National Museum, the Presedential Palace and That Dam all of which I also visited. The one sight I missed is a massive Buddha Park outside the city – this is also recommended by the way. 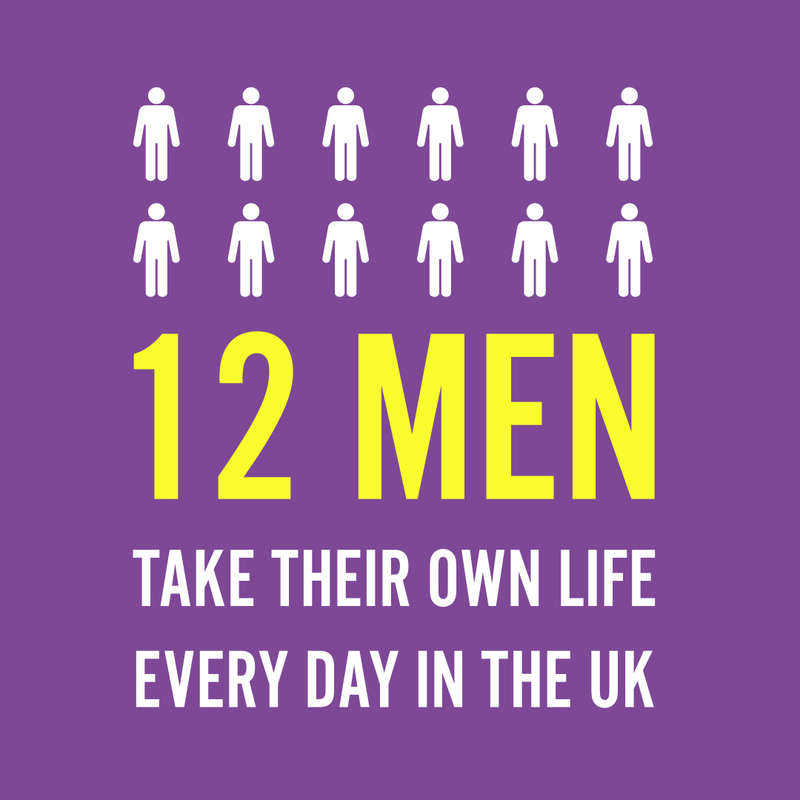 It’s a 22 kilometre ride away. It’s safe to say I’ve had my fix of Buddhas on my travels! My top 5 here misses a few sights such as the Presidential Palace which I also visited. 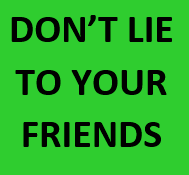 In terms of places to stay you will not likely have to book in advance unless you hear about a busy event coming up. 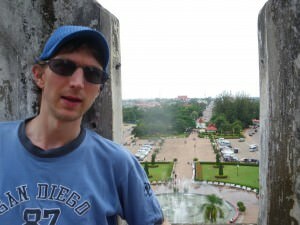 Vientiane is an over sized town rather than a city and the locals are friendly and love tourism. We actually ended up staying in three different hostels over the 3 days the way things worked out. Our top budget tip has to be the Sabaidy Guesthouse on one of the main streets. A shared dorm was only 25,000 Kipp each per night, immense! 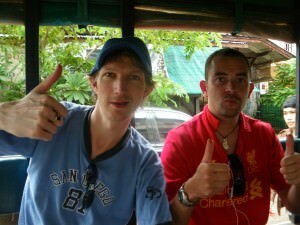 In closing I just have to recommend places as quiet and unknown as Vientiane. I have also been to Asuncion, Gaborone, Minsk, Vaduz and Paramaribo, which are all relatively unknown capital cities. 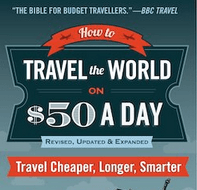 When visiting a new city, get off the beaten track for once – it’s where you will have the best travel experiences. My thanks go to fellow Ulsterman Chaz for being my travel buddy on this trip – can’t wait to meet him for a beer soon. But when you live a lifestyle of travel, things just get delayed. I’ll write more on Laos in times to come. 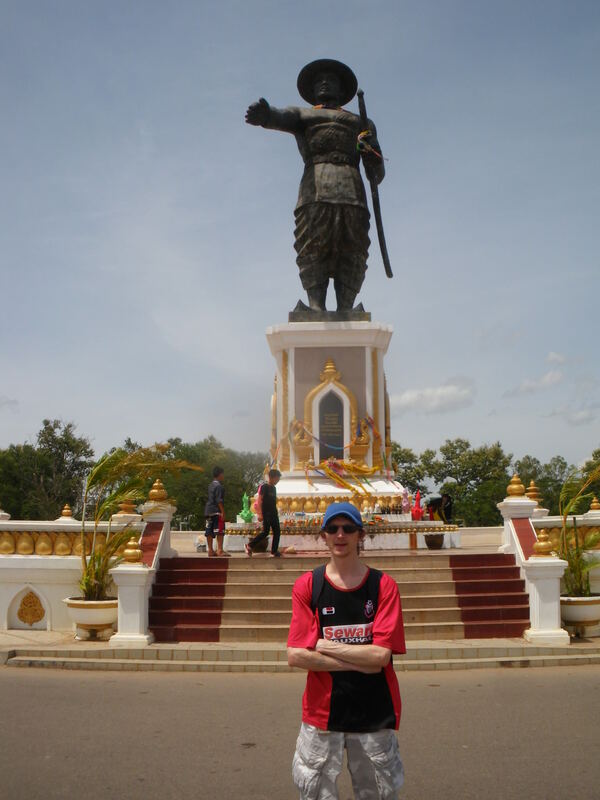 Vientiane – well worth a visit!! 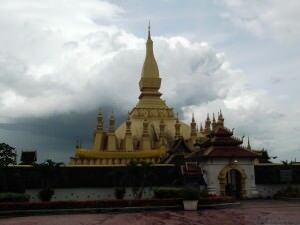 This entry was posted in Asia, Destinations, Laos, Lists, Vientiane. Bookmark the permalink.